Update: Staples has clarified his thoughts via Twitter. YouTube user Twoevils Lesser went viral this week with a video hosted on their channel in which a Christian mother rants about Vince Staples's song "Norf Norf." The unnamed woman ends up in tears during the video blog as she recalls hearing the song on the radio. She recites the lyrics, which discuss Staples's youth as a gang member in Long Beach, and laments the fact it is played on mainstream radio. The video has nearly 700,000 views and has seen the woman labeled as an "angry lady" having a "meltdown" in headlines. However, when asked for his thoughts on the video by The Independent on Wednesday, Staples himself took a more balanced view. "I don’t think it’s funny at all,” he said. “It’s not right to attack someone over their stance, their opinions, and their religion. I think that’s very immature." 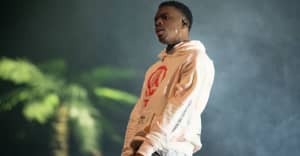 Update: October 6, 5:35 a.m. Vince Staples has claimed he was misquoted by Independent writer Justin Carissimo and tweeted his exact thoughts on the video. Thank you to Justin Carissimo for the misquote. Great Job. Check out the video above, and revisit Vince Staples's FADER cover story here.